About 1 in 5 people who get shingles may have severe nerve pain that lasts months to years after the rash has cleared. This is known as post-herpetic neuralgia. Shingles is a painful skin rash with blisters. It is caused by the varicella-zoster virus, the same virus that causes chickenpox. In some people who have had chickenpox, the virus becomes active again later in life and causes shingles. You cannot get shingles from someone who has shingles. However, it is possible for someone who has not had chickenpox or the chickenpox vaccine to get chickenpox from someone with shingles. This is uncommon and requires direct contact with the fluid from the shingles blisters. About 1 out of 3 people will get shingles in their lifetime. Shingles is more common in people over 50 years of age or in those with immune systems weakened by medication or disease. 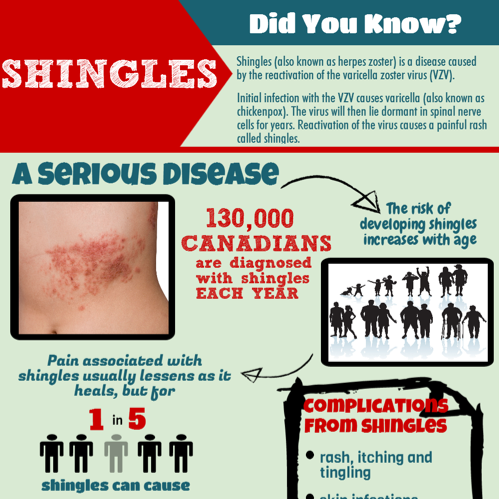 Rare complications of shingles include pneumonia (an infection of the lungs), loss of hearing or vision, scarring, inflammation of the brain (encephalitis) or death. The vaccine has been shown to reduce the risk of getting shingles and post-herpetic neuralgia (PHN) by more than 90%. The immune response to the vaccine is the same for multiple age groups from 50 years of age and older. The vaccine is given as two doses, at least two to six months apart. This vaccine is not provided for free in BC. It costs about $150/dose and is available for purchase from some pharmacies and travel clinics. Call ahead to ask about vaccine availability. Some health insurance plans may cover the cost of the vaccine; check with your insurance provider. Shingrix® may be considered for adults 50 years of age or older with a weakened immune system, discuss the vaccine with your health care provider. 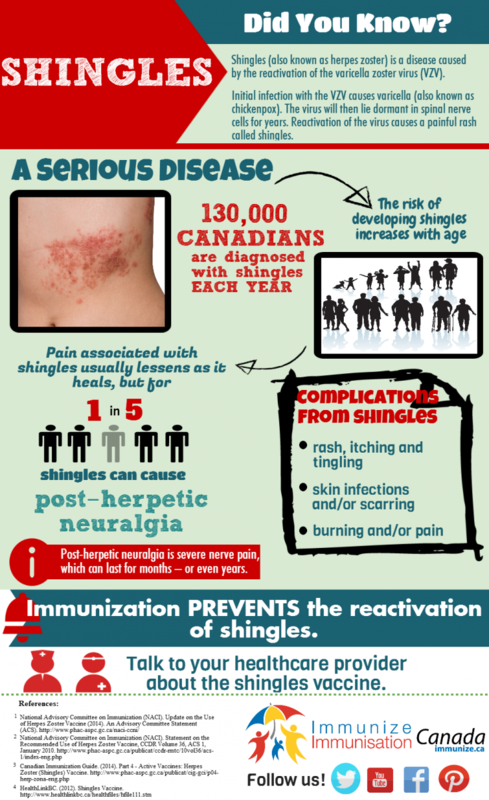 The vaccine has been shown to reduce the risk of getting shingles by 51% and post-herpetic neuralgia (PHN) by 67%. The immune response to the vaccine is strongest for those 50-59 years of age but is less in older individuals. The vaccine is given as a single dose. This vaccine is not provided for free in BC. It costs about $200/dose and is available for purchase from some pharmacies and travel clinics. Call ahead to ask about vaccine availability. Some health insurance plans may cover the cost of the vaccine; check with your insurance provider. Talk with your health care provider if you have questions about the shingles vaccines.